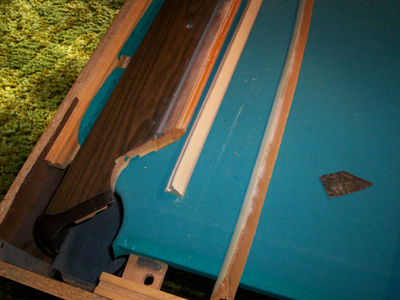 Check out the "Shop" for Pool Table Replacement Parts you may need. 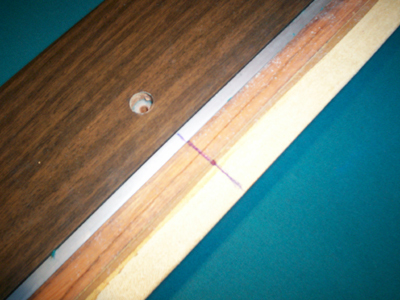 Step Four: When refelting or recovering the top of the uncovered rail of the pool table, there is a thin piece of metal, called a feather strip, that is used to hold the pool table felt in place on the top of each rail of the pool table. Use a straight edge to draw a line across the exact center of the feather strip and the rail. This is so you can replace pool table cushions in the proper place when you’re done refelting them and not end up with one end sticking out, especially when you put the new pool table felt on. 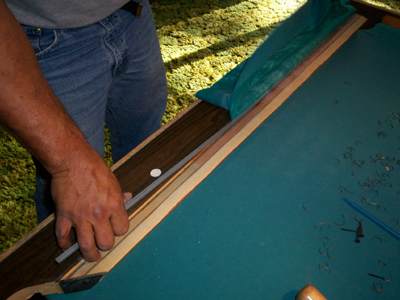 Step Five: Here you can see Allen removing the metal strip from the pool table rail. Start at one end, gently using a screwdriver to get it started if necessary, and then just lift it out of the groove. Don’t damage the wood by using too much pressure. Step Six: In this picture, you can see the old pool table cushion on the right, and the new pool table cushion laying next to the rail. It needs to be cut at the proper angle for each corner of the pool table… don’t assume they are all the same angle or length. To remove it, Allen started at one end, and used a screwdriver to get it started, and then just pulled it off. The small black piece laying on the pool table bed, is a pocket protector that can be reused on the pool table pockets as long as it isn’t damaged.